Milk Crate Basketball, a Traverse City nonprofit, raises money through donations and merchandise sales to cover registration fees and buy basketball gear and apparel for kids who need an assist—whether they play for an organized team or pickup games with friends. The nonprofit has helped 35 kids get on the court since its start in May of last year. 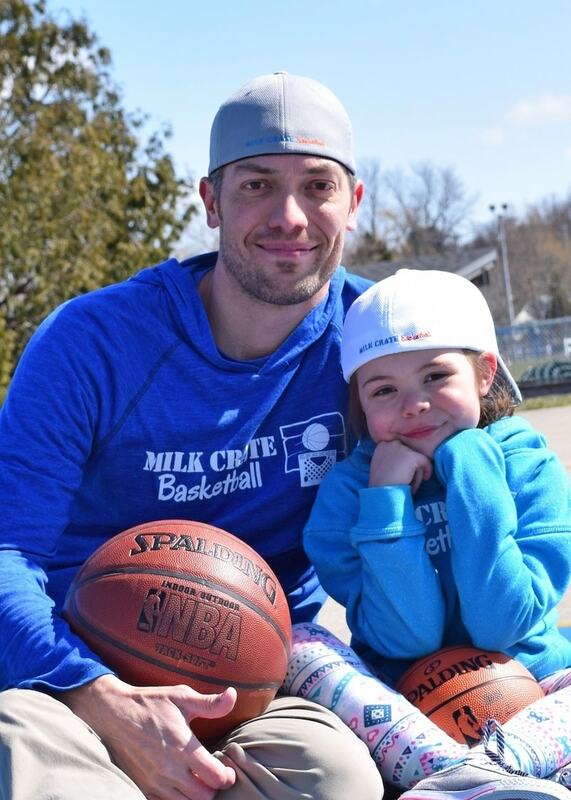 Milk Crate Basketball (MCB) was started by Rod Call, who runs it with the help of his daughter, Savannah. “It’s important to me that she understands what MCB is and why we are doing it,” he says. Rod grew up north of Flint in a trailer park with a concrete slab outside for a shed. His family didn’t have money for a shed so he used it as a basketball court. Rod made a hoop from pieces of wood he found and a milk crate. Rod tells us more about Milk Crate Basketball. After my parents divorced, we moved a lot. Too many schools, houses and friends to count. Basketball was one of the few things in my life that was consistent. I was the perpetual new kid at school and in the neighborhood. So if nothing else, I could shoot hoops and entertain myself—pretend I was Michael Jordan or Isiah Thomas for hours on end. What’s the value in getting your child out on the court or field? I never played very much organized ball—or sports for that matter. We moved way too much to get into any kind of comfort zone. In a sense, I’m trying to help that younger version of myself. I’m trying to help the kids and families who just don’t have the same benefits and resources as others—especially in this area. For me, it wasn’t the experience of teamwork and being coached and all that. It was simply playing a sport that gave me great enjoyment. It gave me a sense of consistency in a very inconsistent world in which I lived. It gave me the chance to eventually meet new kids. Has word been spreading about MCB? Word has pretty much spread organically and through the support of TCAPS LEAP Program (Learning Enrichment Athletic Program). Janna Deering and Julie Gorter from LEAP have been supporters and champions of MCB since I introduced it to them a year ago. Do kids have to live in a certain area to get an assist? Kids do not have to live in a certain area. It’s been the Traverse City area by default at this point. My goal with MCB is to simply assist any kid who needs it regardless of where they live. Furthermore, MCB is not exclusive to organized team play. I’d like to be just as busy in the summer, assisting with getting kids to spend time outdoors on the court. I think it can be argued that it’s just as important, if not more, to work with these kids during summer break. This is when basketball becomes so valuable in their lives. It gets them outside, active, off of the electronic gidgets, gadgets and gizmos—it keeps them busy. Visit milkcratebasketball.org to make a donation or request an assist, and follow Milk Crate Basketball on Facebook.